The Australian Taxation Office (ATO) launched Single Touch Payroll (STP) on 1 July 2018. As a small business owner, you will now be required to use STP-enabled payroll software to report your payroll information to the ATO every time you complete a pay run. Find out what this means for your business and more in our Single Touch Payroll FAQ. Does my small business need STP? Yes – if you employ 20 or more people, then you’re required to use STP for your ATO payroll reporting now. If you employ 19 or fewer people, you’ll need to have STP-enabled payroll software in place from 1 July 2019. Keep in mind that those employee head counts include full-time, part-time, and casual workers. What does STP mean for employers? STP essentially means that employers must now report every payroll event to the ATO at the time the transaction is made. As STP aims to streamline the reporting process, employers can say goodbye to filing monthly or quarterly payroll reports with the ATO. You also no longer have to provide payment summaries to your employees for payments already reported using STP. What’s more, it allows the ATO to pre-fill your business activity statements (BAS), so you’ll save time at the end of each quarter. What does STP mean for employees? For employees, STP means you can save time by lodging pre-filled tax returns and access your end-of-year payment summary in the myGov portal without having to wait for your employer to supply it. You can also access your year-to-date tax and super payment information any time, also via the myGov portal. Does STP equal more admin work for employers? Not at all – STP reporting is run through your payroll software, which means it’s automated. If anything, it will save you time as you no longer have to file monthly or quarterly payroll reports with the ATO. How do I get my business set up for STP? Most payroll software suppliers now provide STP functionality, but it pays to check with your existing vendor to be sure. 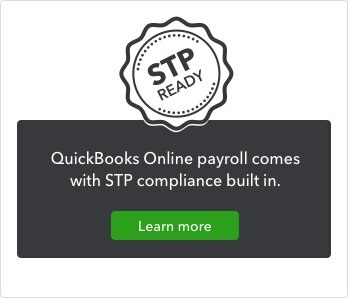 QuickBooks Online integrated Payroll, powered by KeyPay, is already STP compliant. All you need to do is enable electronic lodgement and STP in your QuickBooks Online portal. What does STP report to the ATO? STP reports the PAYG tax and superannuation payments you make on behalf of your employees. However, STP doesn’t make the payments for you, as it’s a reporting tool only. You still have to make your PAYG and superannuation payments through the regular channels. Are there penalties involved for not using STP? The ATO will not impose penalties during the 2018 financial year as businesses transition to the STP system. However, penalties for non-use may be enforced in future years. You can apply for more time to transition to STP via this online form. What if I don’t want to use payroll software? Let’s be real: the days of manual payroll have been counted. If you started using STP this year, you should implement an STP-enabled payroll software solution right away. If you employ 19 or fewer people, you still have time to put payroll software in place until 1 July 2019. STP is really nothing to worry about. In fact, it will make your payroll reporting much easier. It will allow the ATO to pre-fill your quarterly business activity statements and give your employees greater transparency into their year-to-date PAYG and super payments. All you need now is the right payroll software solution in place.